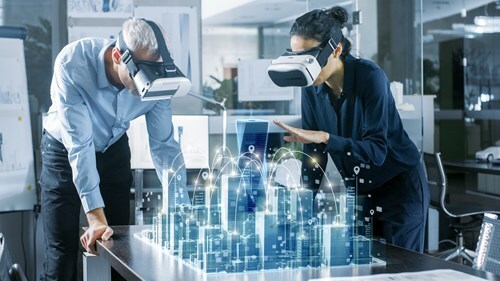 Augmented Reality (AR) and Virtual Reality (VR) holds tremendous promise for changing the way businesses and consumers operate and has the ability to transform nearly every industry and solve many real world problems. However, AR/VR is currently viewed as a predominately solo activity, and many current uses do not take into account the innate human desire for social interaction and collaboration. While there are many innovative companies already developing multi-party collaboration tools for AR and VR, there are still many multi-party uses that remain under explored. From medical and industrial to entertainment and home repair, here are seven of the best multi-party use cases that we have seen. For surgeons, diagnostic imaging such as MRIs and CT scans are the roadmap to a successful surgery. However, displaying these images in a surgical environment poses a challenge and doctors must be able to translate the 2D images they see into a 3D understanding of the patient's body. 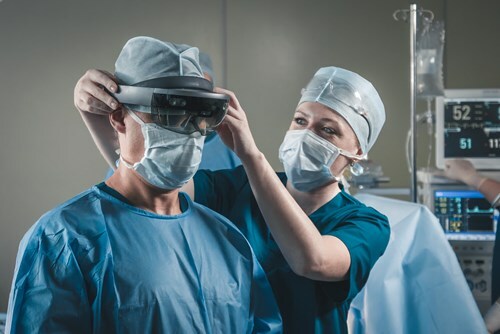 By wearing an augmented reality headset, a surgeon could see important annotations made prior to surgery on a virtual overlay of the body allowing them to know what they need to watch for to make the operation successful. In a typical operating room, patient vitals are displayed on monitors throughout the room, but with augmented reality, this data can be transferred to the surgeon through their headset allowing the surgeon to maintain their focus on the surgery at all times. Making it social: Augmented reality can also be used in telementoring applications. Case Western Reserve University in Cleveland, has begun using AR 3D holograms to teach anatomy rather than human cadavers. Virtual surgery consults are another important use case that is emerging in the field. When surgeons need to perform complicated surgeries they are unfamiliar with, multi-party augmented reality experiences allow expert surgeons from other cities to connect visually to the surgery for further guidance and training. As smart glasses and headsets become more mainstream, more organizations are looking for ways to utilize this technology to solve real customer problems. Residential homeowner maintenance and repair can pose a real problem to consumers if they lack the technical or mechanical knowledge needed to perform the fix themselves. Remote locations and busy schedules can come in the way of customers getting the help when and where they need it. Augmented reality technology makes it possible for inexperienced users to identify problems and perform repairs by following step-by-step instructions on AR headsets or handheld devices. Making it social: With AR, customer service agents and knowledgeable technicians can walk customers through simple fixes. 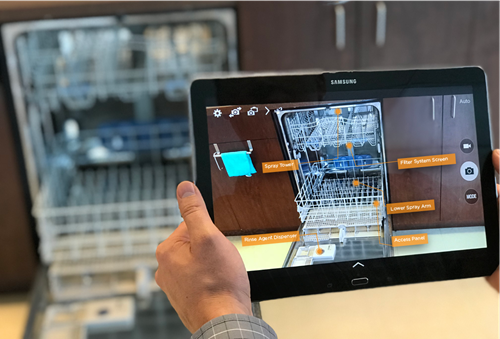 With the ability to communicate in real time and see what the customer is seeing with AR overlays, the technician can help solve the problem and avoid costly house calls or warranties. Everyday, field service technicians are dispatched to repair equipment that is critical to day-to-day operations and business success. These technicians often need to work in remote areas with little access to help should a problem arise. With the use of AR technology, these technicians can use AR headsets to download manuals hands-free and superimpose diagrams on equipment, when they need additional information. Making it social: When a manual is insufficient for solving a complex technical problem, multi-party AR can allow real-time remote experts located anywhere in the world to connect and provide help. The expert can see what the technician sees and provide step-by-step instructions on how to proceed. Through multi-party AR experiences, organizations are able to improve technician safety, reduce travel expenses, maximize their expert’s time and train a new generation of technicians on complicated technical fixes. Technical training institutions, require hands-on technical training to impart knowledge on their students but providing this training in a safe, hands-on and cost effective environment can prove difficult. That is why training providers are starting to look to AR and VR to revolutionize the way their students learn and to provide them with immersive training simulations. In the aircraft maintenance field, for instance, it would be impractical and cost prohibitive to bring multiple airplanes to a training facility without a dedicated hangar and runway for transport. However, with AR/VR, training facilities can now exist anywhere - bringing the plane to the student. Making it social: Students can jointly work together to fix a virtual commercial aircraft without ever having to step foot in a hangar. Offsite guest lecturers can even be brought into the virtual training environment to give students even more knowledge. Regardless of the industry or area of technical expertise, AR/VR provides a tremendous opportunity for creating hands on learning. People have a strong desire to be in on the action, especially when it comes to concerts and sporting events, but cost barriers, limited seating, and event location can make it difficult for consumers to attend. Virtual reality has the potential to help overcome these barriers by bringing the real-time event experience to people in the comfort of their own homes. Making it social: Consumers want to experience the buzz in the building and feed off of the energy in the crowd. With multi-party immersive virtual reality experiences, participants can view the event in real-time with other remote spectators and experience the event closer to the action then would be possible if they were attending in person. Not everyone is capable of visualizing a 3D design from a 2D blueprint, but with AR modelling, professionals are able to recreate their designs virtually - allowing their coworkers and clients to quickly obtain a comprehensive picture of the final product. AR design and modelling saves time and prevents customer misunderstandings by allowing customers to better visualize the end result throughout the creative process. 3D modelling has applications in a wide array of industries from interior design to architecture, engineering, construction, and mining. Sharing virtual models across distances can also be a challenge. With today’s global marketplace it is not uncommon to work with professionals across borders and continents. With multi-party AR, professionals can present their work to their global clients in real-time and make changes and annotations on the fly. Multi-party AR/VR is here to stay. Need help adding multi-party functionality to your AR or VR application? Check out LiveSwitch -- the massively flexible, highly scalable video conferencing solution. As Frozen Mountain’s CEO, Jerod is passionate about applying real time communications technology to find innovative solutions to business problems. 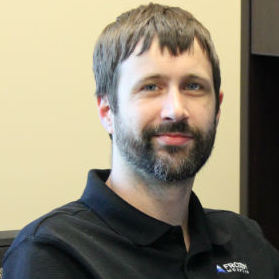 Jerod is continuously engaged in ensuring each and every customer receives the highest quality products and service from our team and is always excited to explore and satisfy the unique requirements of each new project.